Ours is a collaboration of woodworking and finishing skills in creating unusual furniture. Each piece is carefully crafted by hand in our studio, located in the enchanted mountain valley of Ojo Sarco. Possessing characters with their own personalities, these pieces evoke images from fairy tales. The surprising shapes and curving lines achieve a subtle humor not often found in contemporary furniture. The candelabras are the sole creation of Jean. 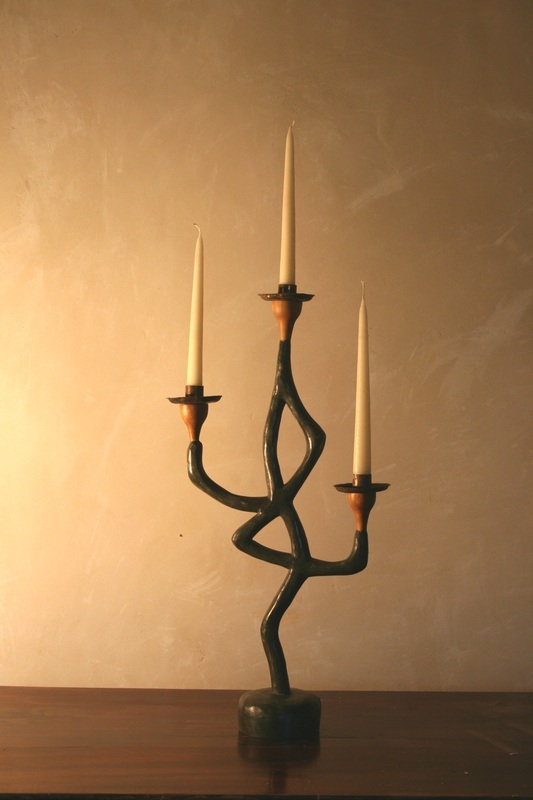 His skills as a plasterer and carpenter led him to explore a path of sculpted candelabras. Mixing different medias, these candelabras express a dialogue between art and craftsmanship. Each piece is original and shows a concentration of the qualities specific to Jean’s paintings and drawings: an outstanding palette of colors to catch memory and desire in movement….